Maryland farms produce wheat as a commercial crop, with 180,000 acres under cultivation in 2009 producing 12 million bushels. Home gardeners who also try their hand at this ancient grain find that it grows as easily as grass in a sunny fertile spot; the trick comes later, when it’s time to thresh the crop. You’ll find that 6 lbs. of planted wheat can yield nearly 50 lbs. of grain, reports Mother Earth News. Loosen the soil to a depth of 4 to 6 inches. Choose a sunny, well-drained area with a pH of about 6.4 as tested with a soil testing kit. 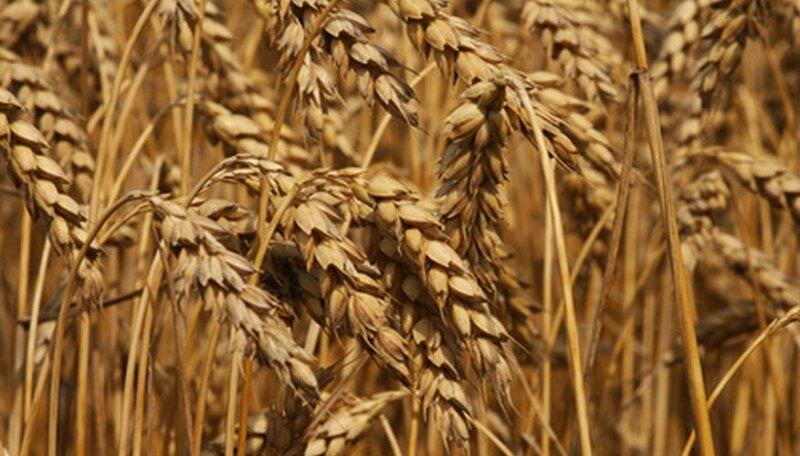 Plant the wheat in the fall to allow for six to eight weeks of growing before the soil freezes. Broadcast the seed by dividing it into two piles, and toss half in an east-west direction and the other half in a north-south direction. Use a seed with a good performance record in Maryland, such as Massey, Potomac, Saluda, Severn, Tyier and Wheeler, recommended by the Maryland Extension Service. Rake the soil to a depth of 2 to 2 ½ inches to cover most of the seeds. Don't worry if all the seed isn't covered; enough seed will germinate anyway. Firm the soil over the seeds to ensure good contact between the seeds and the soil. Your wheat will sprout, turn brown over winter, and begin to grow rapidly as the days of spring warm the soil. Cover the crop with a net as the grain nears maturity, around July 1 in most parts of Maryland, to avoid birds decimating it. Test the grain when the color of the stalks turns from green to either yellow or brown. The heads will be tipping toward the earth. Choose a head and pick out some grains. Chew the seeds. If they are soft and chewy, they are not ready. Harvest when the grains taste crunchy and hard by snipping off the heads of the wheat. Hang the harvested wheat upside down to dry prior to threshing it. In Maryland, the target date for planting wheat occurs when Hessian fly infestations, a significant pest to wheat crops in the United States, cannot establish themselves. This falls between Sept. 20 in extreme Western Maryland and Oct. 11 on the lower Eastern Shore. Select a small test area to grow your wheat in before committing much of your garden space to wheat. Pick an area that is sunny and well-drained with fertile soil. Six pounds of seeds will cover an area of 1,000 square feet. Avoid fertilizing wheat, especially if growing it in on a patch of soil that has been fertilized previously for other crops. Heavily fertilized wheat is more prone to fungal diseases, Gene Logsdon writes in "Small-Scale Grain Raising."